“The present hour claims in such an urgent way that in human, national and international coexistence, immovable positions and unilateral viewpoints, which tend to make more difficult the understanding and ineffective collaborative effort, should be cast out. Possible discrepancies and difficulties have to be solved by looking tirelessly for what unites everyone, with patient and sincere dialogue, mutual understanding and a loyal willingness to listen, which accept goals filled with new hope. 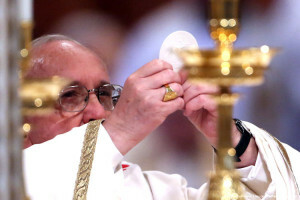 The words of the Holy Father, connected in the same line to the ones of his predecessor, re-evoke the patient and true dialogue, in order for reality to change and with it the life of the Cuban nation. As a result of this trip remained the commemoration of Good Friday as a holiday, legally stablished by the government. The mediation of the Catholic Church for the release of almost all political prisoners convicted from the Black Spring days, although this process had already begun months earlier when preparations for the Pope’s visit to Cuba were initiated and as a result of the unprecedented dialogue between General Castro and the Church, after assuming the presidency of the State Council of the Republic. Progress was made in the construction of the Seminary of San Carlos and San Ambrosio in Havana, the first ever approved to be built after the dictatorship was installed in power. A refunding process of properties previously expropriated from the Catholic Church and other religious confessions started as well. The Church was allowed to start training people on different issues like economics, usiness administration and many other aspects. If we value all these events with a pragmatic perspective, we can see how they have created different scenarios of dialogue and concessions from the government, in this case with the Catholic Church or through it. However it’s true that it didn’t happen with the speed and depth desired and needed. The General and his subordinates know that they don’t have much time, they don’t have the messianic mysticism of the bearded commander and because of their age, the situation does not grant them much time to maneuver. Of course that no change glimpsed by them would be for an opening towards the Rule of Law, democratic and inclusive we aspire. But they had never before been in such a vulnerable position. At the same time some questions arise: Why the dictator has not dialogued with the opposition? Why he did so with the Catholic Church and not the opposition? Is it realistic to expect an opening from the regime to democracy, dialogue and national reconciliation through peaceful means? First we must remember that for the communist hierarchy and its political-military machinery, the Catholic Church has always been considered a powerful adversary, part of the “counterrevolutionary worms” that had to be crushed, suppressed and exterminated. Then, by starting a dialogue with representatives of the Church, they have begun the dialogue with a section of the opposition. It’s true they have not spoken to political parties or social movements of the rest of civil society, or the exile. But it would be unwise and even little serious to ignore the church as an institution that brings together many Cubans and has never been aligned with the government, but rather repressed, silenced, exiled, slandered and discredited by Castro’s propaganda and all its institutional machinery. The Church’s social doctrine does not encourage violence and demands –on its coherent dialogue- a series of well-defined objectives that are supported by hundreds of thousands of the Cuban Catholics it represents. The opposition, which grows colored by different political parties or social movements, has no doctrine or alternative program that most people are familiar with or that a large majority of the people assume with full identity. Let’s recall the Varela project and also take that example. After the thousands of signatures submitted to the National Assembly, the emeritus tyrant called a referendum to further radicalize the constitution of the Republic, knowing that the sympathy that project had aroused in the population was real and although it was not a large percentage of the citizens who signed it, were indeed millions who watched that project with total support. Unfortunately, the political circumstances at the time were not those of today. We must analyze whether the demands of opposition groups match the ones of the majority of Cuban citizens, if there is harmony between what the parties consider important and what people regard as important. Meanwhile, the General continues to dialogue with the “imperialism”. Embassies got opened, tourists come over, the galloping increase of commercial contracts, dollars get multiplied and gross domestic product grows. Many other changes will be introduced by the dictatorship. It’s up to our intelligence and wisdom whether Cuba opens up to Cubans in peace with all its magnificent potential, or instead, we give them once again another chance without having to respond to popular discontent and their discredit and act against a Cuba for all Cubans. The dismantling of the regime and the reconstruction of the nation can only be achieved by non-violent means. That is the only field of operations for which they are not prepared. Another Catholic Pontifex, Francis, through whom the opening dialogue has been materialized with our new “fellows of the Turbulent North and no longer brutal” comes to Cuba. His message this time is as a “missionary of Mercy”. We’ll listen to the bishop of Rome speaking –in perfect Spanish- to the people about reconciliation, forgiveness, peaceful coexistence, and respect for the ideas of all… And I do not rule out a more bold statement considering his performance in previous visits to different countries since he began his pontificate. This is not about putting our hopes on the Pope, but the opportunity for the people to hear and comprehend what that message means. SOMOS+ (#WeAreMore) the citizens that every day long for a change. May be blessed the one who comes in the name of the Lord.